For the fifth time, Director Tony Scott and Denzel Washington have teamed up for another action thriller. Strangely enough, Unstoppable marks the second straight Scott/Washington combo that deals with trains. In last year's Taking of Pelham 123, Washington played an official in the underground subway industry. 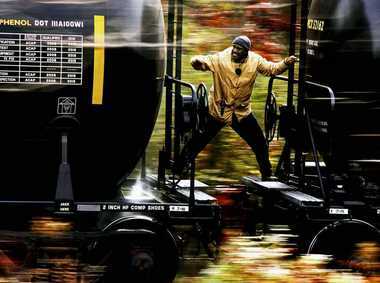 This time around Denzel is a train conductor above ground working one of his last shifts, operating an engine with the new up-and-coming company hire (Star Trek's Chris Pine). Due to an error by a train worker, a fully linked multi-car train is on the loose, operating at speeds of over 50 MPH with no one driving it. Washington and Pine just happened to be in the wrong place and the wrong time and decide to try to run down the out-of-control train to slow it down before it reaches a populated area. As the action unfolds, we end up with three main characters in this movie: Washington, Pine and the runaway train itself. Scott does a great job with establishing the train as an independent character. Unstoppable is an excellent action thriller that becomes a non-stop bundle of energy after the opening half-hour. Scott never eases up on the throttle and I never found myself bored or looking at my watch throughout the runaway train ordeal. Rosario Dawson is serviceable in a supporting role, but Denzel and Pine really do carry this film. Washington never really makes a bad movie and Pine is slowly but surely becoming one of the go-to young actors working today. The biggest problem I had with the movie was the constant coverage of Denzel's two daughters who worked as Hooters waitresses. Let's just say that their reaction of the perils that their dad was involved with on TV were rather unbelievable. Thankfully there is not much wrong with this movie and it really is one of the most exciting movies of 2010. A healthy 4 out of 5 JRs for Unstoppable.